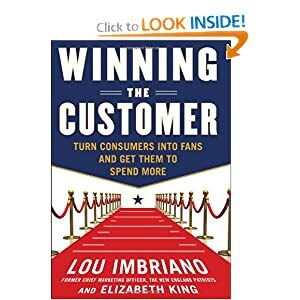 I am rather belated in getting this book review out, although I did cheat a bit and offer a preview of what I think about Lou Imbriano’s Winning the Customer. Wonder no more, as I’m sure you were. I finished the book tonight, just now, in fact, and I can’t wait to tell you about why I am bummed the book is now over. First, a preface. One thing you should know is that my dad (aka my boss) has forever tied business principles with sports analogies. PR is a 3-pointer. The goal is to always hit it out of the park. Etc. So, when Lou’s book arrived in the mail and I started reading his business principles through the prism of his experiences with the New England Patriots, it seemed like a natural extension of my ongoing business and marketing education. Winning the Customer is built in a way that makes a lot of sense. Lou begins with the structure of your team. He talks about the importance of everybody (and that’s everybody with a capital everybody) in your organization understanding the importance of your brand, the importance of your company’s database, the importance of your customers, and the importance of your prospects. From there, Lou goes on to discuss what he calls Relationship Architecture. The relationship architect is sort of reminiscent of the trust agent that Brogan and Smith wrote about a few years back, but this fella works beyond the realm of the online world. He (or she) goes out of his way for customers, even if it means potentially losing a little money. He shows genuine interest in making life better for his network. If that can carry over to the online world too, great. Finally, everything is woven together to show how the right structure and the right relationship can result in revenue. According to several MBAs I’ve polled, businesses like revenue. One student even indicated that revenue is entirely necessary. A lot of times, I feel like advice that is disseminated in the world of social media is kind of……foofy. People talk about eliminating silos, doing only nice things for other people, and well, it gets to be hard to imagine how their companies can ever make any money. In fact, in the online world it’s gotten to the point where making money seems to be a sin and saying “no” in any shape or form is entirely taboo. Winning the Customer does not shy away from either of these words. Lou does the unthinkable and reveals that many, many businesses are out there to make money. He also reveals what so many of us have been thinking, I’m sure. That person who ALWAYS says yes – they’re probably full of something unsavory. They are not genuine. You can’t always meet someone’s expectations. You can’t always over-deliver. And you can’t always find that guy’s horrible jokes funny. That’s okay. Sometimes saying no is better for you and your customer in the long run. Wacky stuff, but it all makes sense as you read along with Winning the Customer (not an affiliate link). One thing I really enjoyed in this book was the part where Lou talks about the importance of tying the bow. Sure, the prize can be great, and the wrapping paper can add to the whole experience, but that ribbon that ties it all together – that can really make the big impression. So it is in the world of business and relationships. For me, the bow when it comes to Lou Imbriano and his book is that I know he lives everything he talks about. He was able to write about it because in the end, it’s his philosophy. This has been proven to me in many ways over the last year or so. I’ve watched Lou interact with many people and I’ve never seen him say a negative word about anyone or anything. Lou always remembers my penchant for expresso coffee beans and taunts me with pictures and mentions of them on a regular basis – it’s a little personal detail that makes me feel like I’m a person who matters. And instead of just sending me his book to read, Lou included a love inscription on the inside cover of my book. These all sound like little things, but as you read Winning the Customer, you see that they are all at the core of what Lou wants you to do in your business world and in the online world. It’s all about tying the bow. It’s all about relationships. And it’s all about knowing how to do both of those things in a way that will make money for you and your company. Winning the Customer is a fun read, a fascinating read, and a valuable read. I can’t recommend it enough. Go get it! Okay, now adding this one to my list of reads! Will read this after done with Ric Dragon’s book and before starting Job’s biography… Margie Thank You for the preview!